I hope everyone had a wonderful Thanksgiving! Here are this week’s try-ons to help you prep your shopping carts. I polled my Instagram stories followers and over 60% that responded are holding out until Cyber Monday. When I checked my previous years’ blog posts LOFT has been offering 50% off plus FREE shipping on Cyber Monday. I guess we shall find out soon enough! You can follow all of my recent purchases here. Update 11/26: LOFT‘s Cyber Monday sale is now live! Use code CLICK for 50% off everything plus FREE shipping! I will share clips of a few new try-ons on the Instagram links page and in my Instagram stories so please stay tuned! Also, the best way to check if I reviewed an item is to Google ‘whatjesswore’ + the exact item name. I am usually the top search result if I reviewed the item. 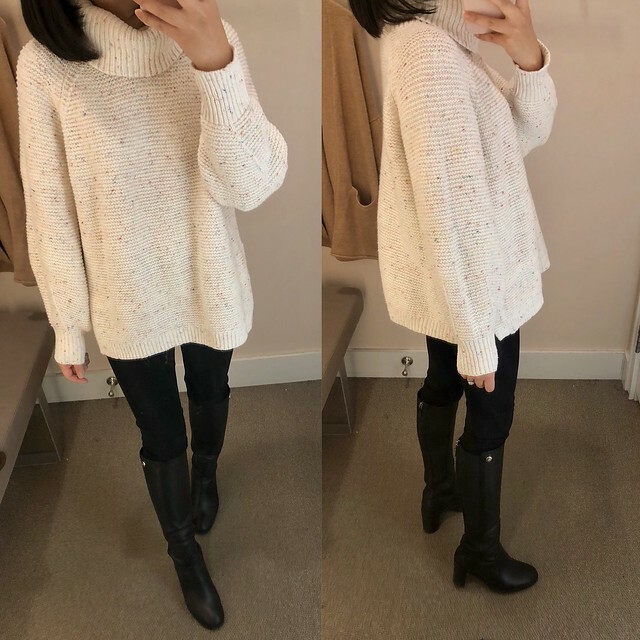 This textured sweater was on my wishlist and I finally found size XS regular to try on today. It definitely has an oversized, but still flattering fit. I would need my usual size XXS for the best fit but my preferred size is currently sold out online. In person I felt like the textured stripes added bulk. It contains 5% alpalca but it didn’t feel very itchy when I tried it on. See a close up of the sweater here. You can also this sweater on Lilly in size S regular. I love her chic, minimalist style and she loves LOFT and Ann Taylor too! Thanks to Su for sharing a new blogger for me to follow. 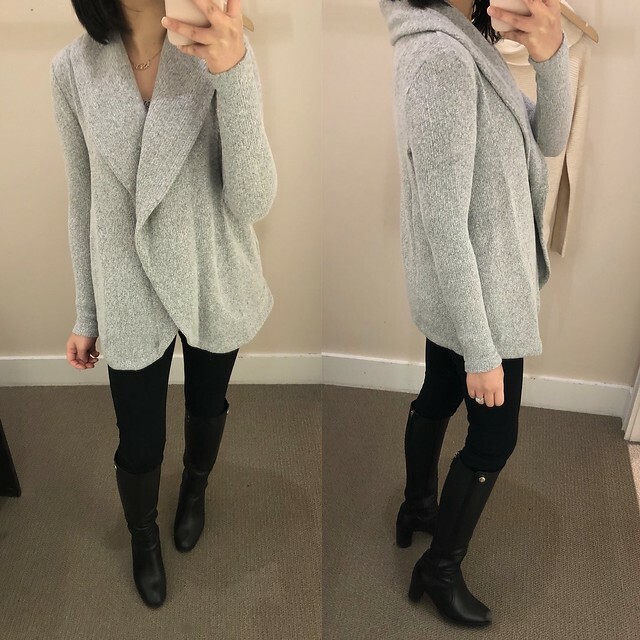 I saw this cardigan on Uyen in size M here and I knew had to try it on. She and I are of similar size from chatting with her via DM since she is usually 00 and XXS regular at LOFT. If you love dresses and ultra feminine and on-trend styles then you need to follow Uyen! I love how the texture of this sweater reminds me of Funfetti. It’s currently sold out online and it’s also selling down very quickly in stores. It has a very wide fit through the body but if you view the video clip of my try-on you can see that the looser fit is adorable. It’s also very cozy! I reviewed size XXSP previously here but after seeing it on Annie I had to try on the next size up which is actually my usual size XSP. 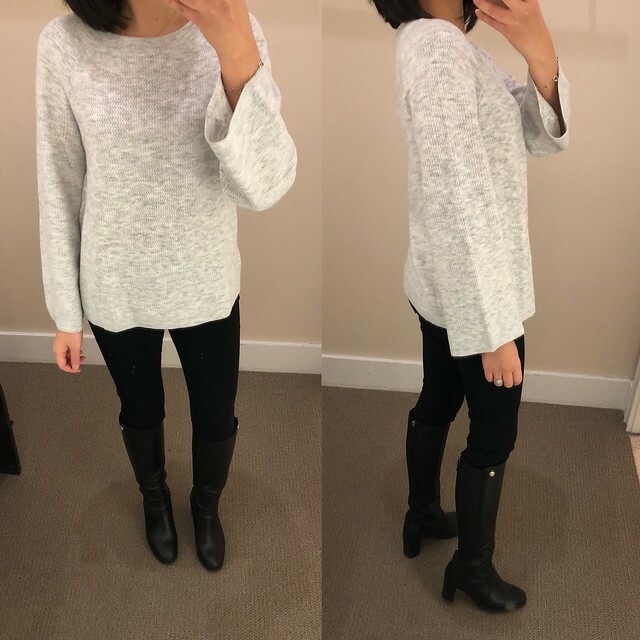 This tunic sweater runs longer so if you normally take regular missy sizes you may want to try petites for a better overall length. I love the mixed plaid print on this infinity scarf. The larger and small plaid print are a fun combination for added interest. 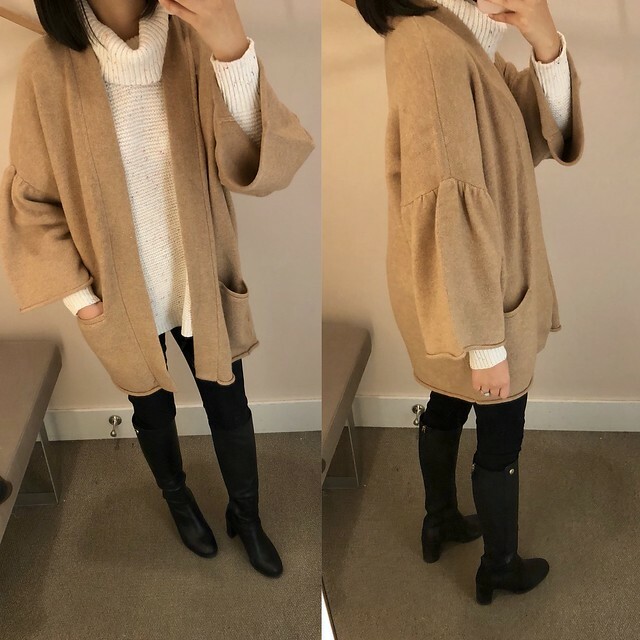 I love and would recommend this soft textured bell sleeve sweater. The bell sleeves are just right so they won’t get in the way. I tried on size XS regular which was a bit loose on me at the chest. I believe I need my usual size XXS regular for the best fit and length. You can see the aloe shade color here. I was curious about this darker wash but I wasn’t a fan of the distressing on this pair. I love and prefer the lighter wash I reviewed here. Both pairs fit as expected in my usual size 25/0P. 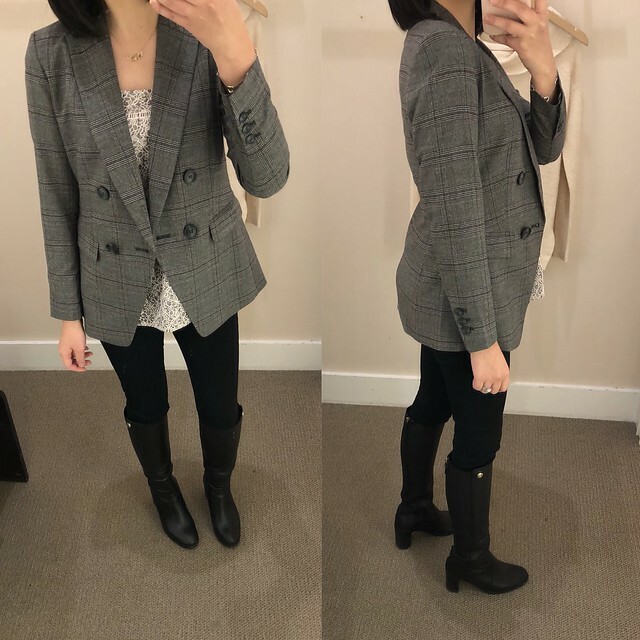 One of my followers asked me to try on this blazer for my Instagram stories. I finally found it in stores and in petites to try. I found that size 00P fits like size 0P. The sleeves are a bit short on me since I have longer arms that many petites. This blazer reminds me of a menswear inspired blazer that I still have from Theory as reviewed here. I got this cardigan in store on Friday when it 40% off. I just had to have it since the color and material reminds me of my beloved mockneck swing sweater from last year. Update 1/7: I ended up exchanging this for size XSP reviewed here. 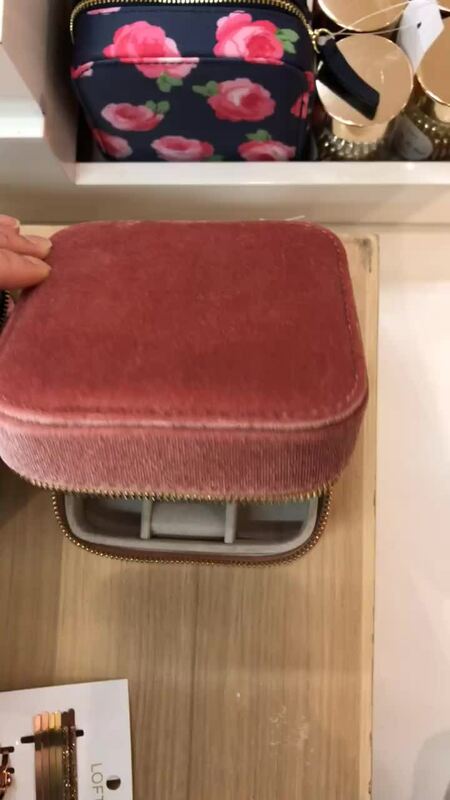 This is really cute travel sized jewelry case and it would make a great present this holiday paired with some cute jewelry. I love the blue essence color. 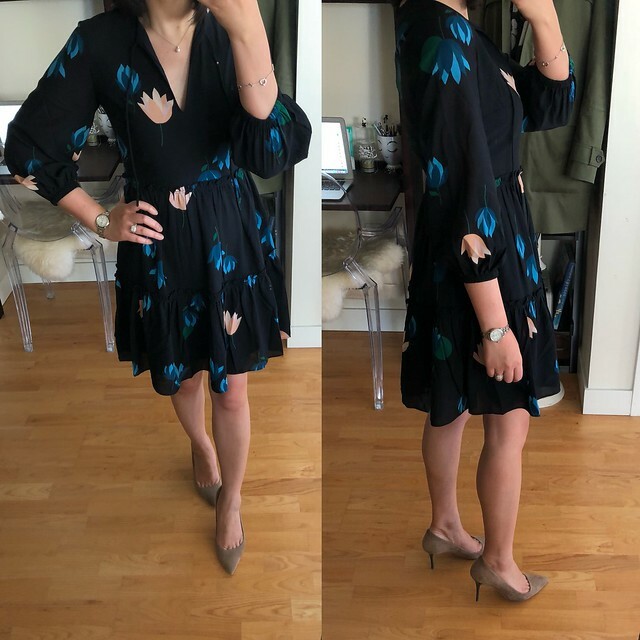 I ordered this dress in size 00P since Su (swipe left in her post 5 times, she was trying on size 0P) fits like size 0P. The waist is a bit snug on me but hopefully I will prioritize exercise this year and slim down in my waist which is my problem area. You can also see this dress on Lilly. 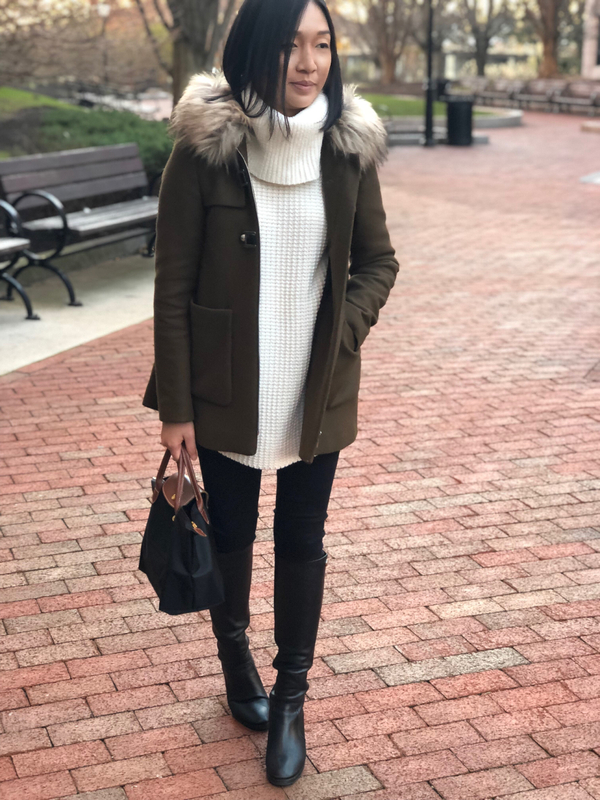 The dress is fully lined and the color palette makes it perfect to style and wear year round by changing out the footwear and adding seasonably appropriate layer on top as needed (e.g. jean jacket for spring, cozy cardigan for fall/winter). 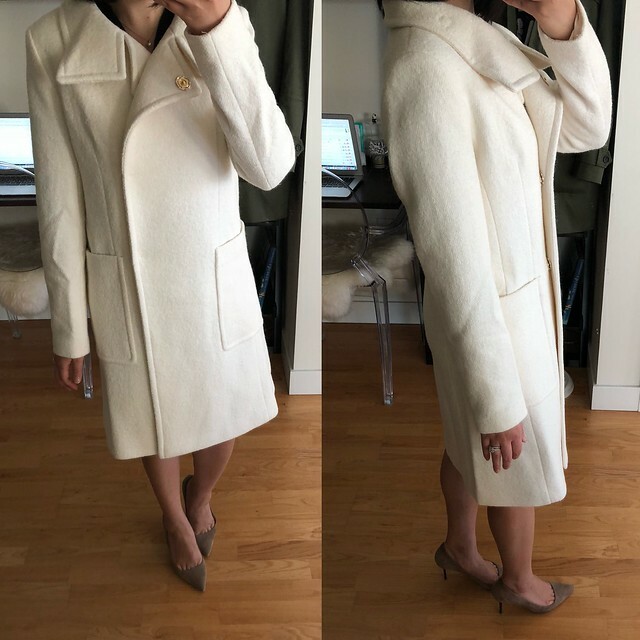 I’ve been looking for a winter white coat but the sizing runs large for this coat. 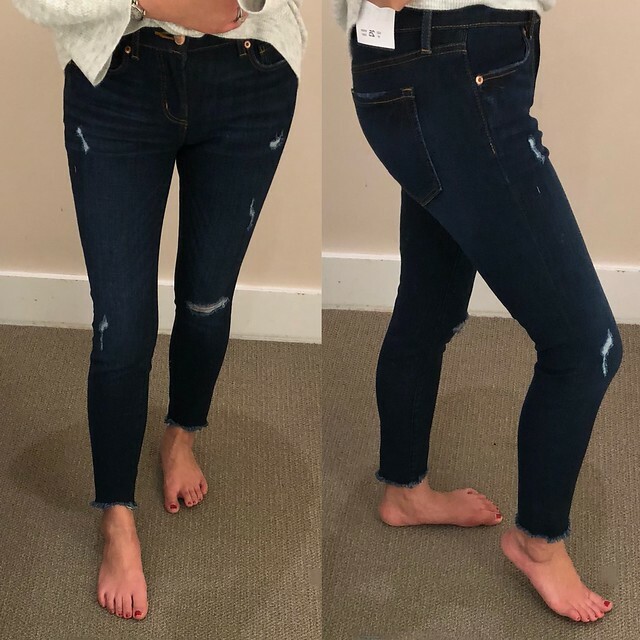 Size XXS regular was too long on me so I believe size XSP would be the best fit. It’s not a warm coat and more for looks so it’s not a must have for me since I live in New England. 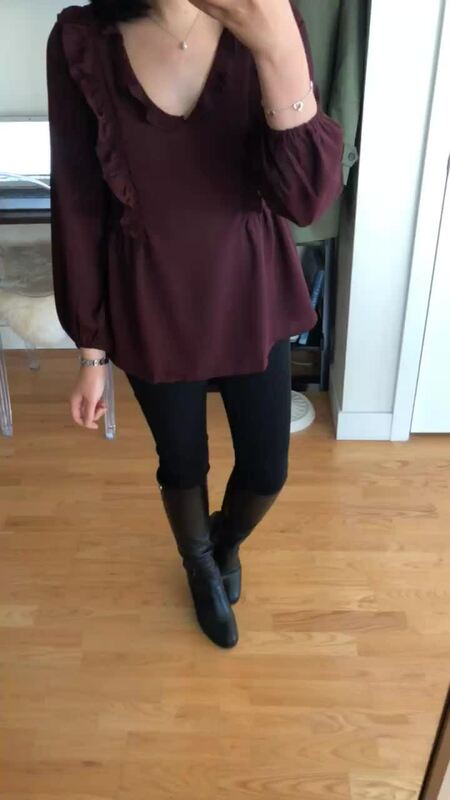 The ruffles and burgundy color of this top caught my eye in stores so I ordered size XXSP. The online reviewers mentioned that this top ran big so I’m glad I sized down since size XXSP fits like size XSP. 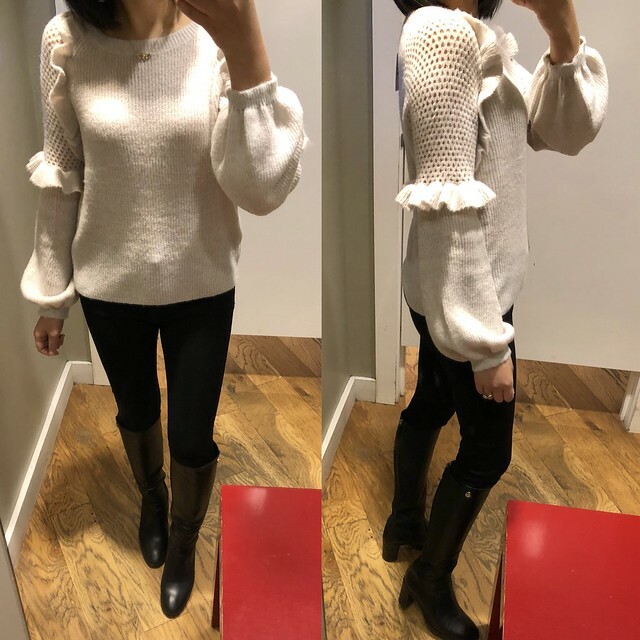 It’s a beautiful blouse for the holidays since the ruffle details make it look dressy. 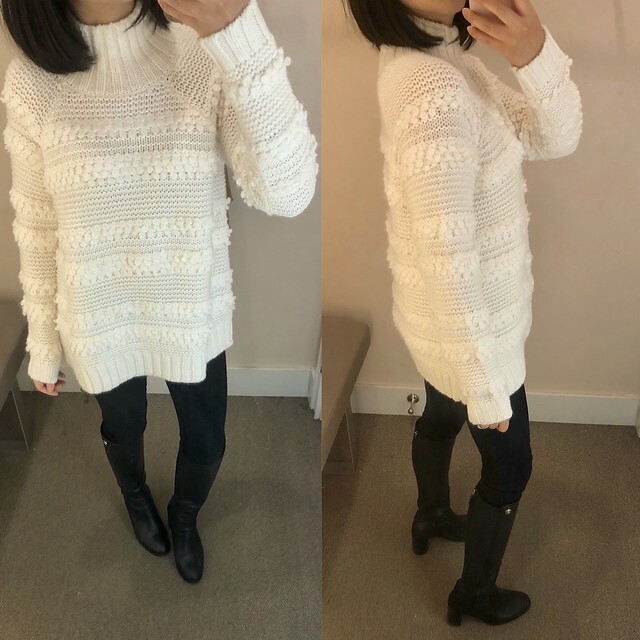 I saw this sweater on @closet_boss and I had to try it for myself especially since Target is offering free shipping through the holidays. 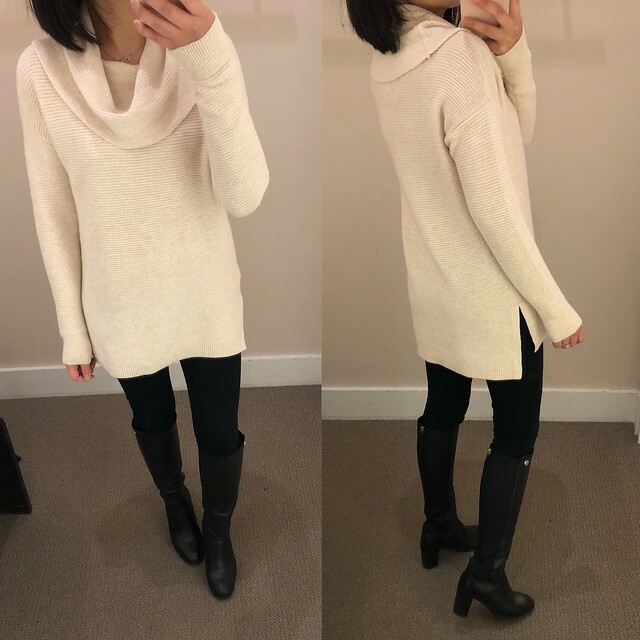 I wasn’t too sure about the giant cowlneck/turtleneck but I really love the texture. My husband loved this sweater so I decided to keep it. For reference I’m 5′ 2.5′. Lastly I swung by Express because a few bloggers I follow have been doing sponsored posts for them. I had to see if this highly recommended sweater was worth all the hype and attention it was receiving. 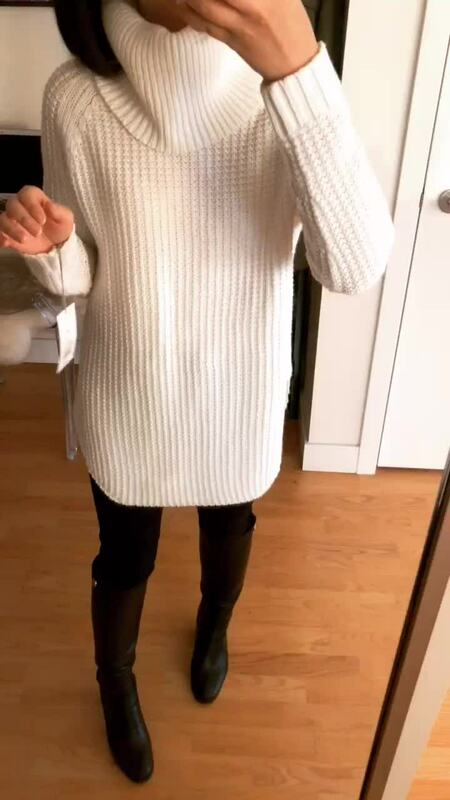 I had to admit it’s a really cute sweater but the overall length is short so it doesn’t cover my front and backside which I prefer. It’s also a thinner sweater so it’s slightly sheer in the soft alabaster color which requires a layering cami. For the latest updates between posts please check out my Instagram Links and sale alerts page. LOFT – Get 50% off everything. Use code FRIYAY. Valid in stores and online. Sale ends 11/25 at 10:59PM ET. Update 11/26: LOFT‘s Cyber Monday sale is now live! Use code CLICK for 50% off everything plus FREE shipping! The Black Friyay collection is also available online if you search ‘plaid‘ and ‘embroidered‘. Thanks to @jasmina.am for noticing and sharing this tip! 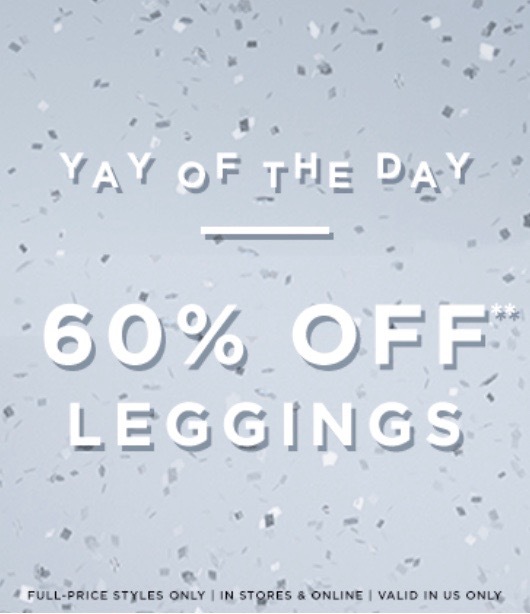 Today’s yay of the day deal (day 5) is 60% off select leggings and they include my favorite legging jeans (review here) as well as the sateen legging jeans (review here). Since the daily deal requires no code online you can use code INSIDER371 for an extra $25 off full-price promotional orders of $100+. 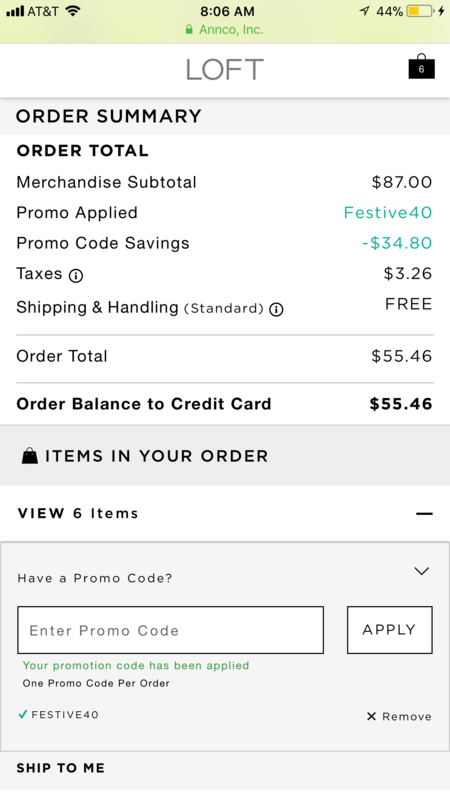 Alternatively, cardmembers can use code FESTIVE40 (the online shopping strategy I shared in this post) to save an extra 40% off. Both of these codes exclude full-price Lou & Grey. Note: You won’t see the extra 40% off reflected until you enter your credit card’s security code when reviewing your order and before you click on the ‘place order’ button. If you’re unfamiliar with shopping at LOFT the best savings to be had are on select full-price items that are part of the daily deals. Look for items clearly marked ‘no code needed’ since the shopping cart only accepts one code at checkout. The ‘no code needed’ daily deals are the best way to shop and save because you can apply a cardmember code or a LOFT INSIDER code for additional savings. The latest valid codes are always shared on the sale alerts page of my blog. I also shared a new in-store cardmember offer I received from @adorableloan in my Instagram stories. Take an additional 5% off your entire purchase at Ann Taylor and LOFT stores with your LOVELOFT or Ann Taylor Credit card. I was able to use this offer in store today on top of the current 50% off sale. Here is the physical mailer and here is the mobile version of the coupon. Text EXTRA5 to 75013 to save the offer to your mobile wallet. 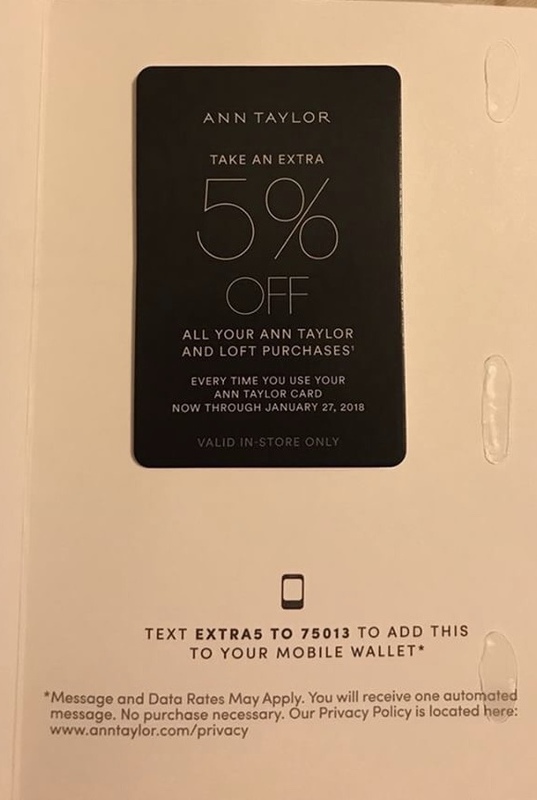 This code is valid in stores only and for multiple use at both LOFT and Ann Taylor now through January 27, 2018. Read the fine print here. Ann Taylor – Get 50% off everything. Use code GOPINK. Valid in stores and online. Shop the limited edition pink weekend collection and they’ll donate 20% of the purchase price to the Breast Cancer Research Foundation. 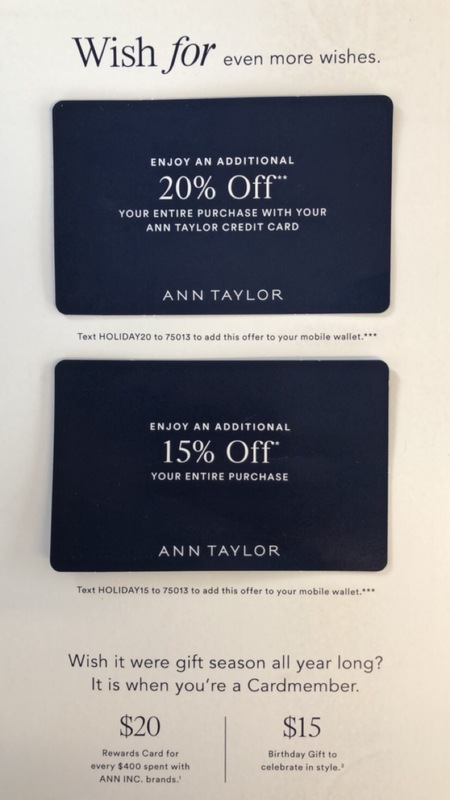 In case you missed this offer I shared in my Instagram stories the other day, cardmembers enjoy an extra 20% off your entire purchase at Ann Taylor with code HOLIDAY20* (text HOLIDAY20 to 75013 to add this offer to your mobile wallet). Non-cardmembers enjoy an extra 15% off your entire purchase at Ann Taylor with code HOLIDAY15 (text HOLIDAY15 to 75013 to add this offer to your mobile wallet). Valid November 14-January 4, 2018. Certain product exclusions apply. Here is the physical mailer and here and here are the mobile versions of the coupon. Amazon – Get two copies of Emily Ley‘s new ‘A Simplified Life‘ book for $15 using code GIFTBOOK17. I heard about Emily’s Simplified Planners before although I don’t use any planners myself. I recently came across her interview in a recent episode of the The Influencer Podcast with Julie Solomon. Banana Republic – Get 50% off everything. Cardmembers get an extra 10% off with code BRCARD. DSW – These Sporto Degas II Duck Boots (review here) are 20% off with code BLACKFRI20! 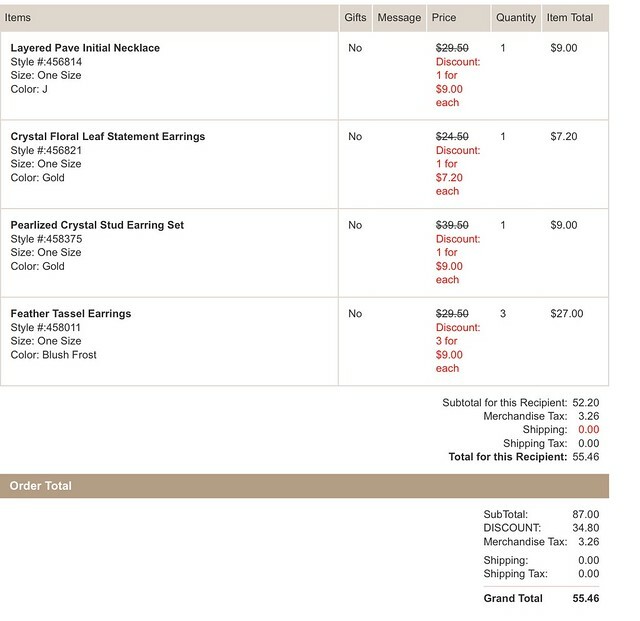 I ordered them in the tan/navy color too for this sale price. I recently scored this similar pair from Shoes.com for my mom for only $25 thanks to a tip from @jen.hamm. She’ll return this similar pair she purchased for full-price at Bloomingdales. Express – Get 50% off everything + FREE shipping! Valid in stores and online. 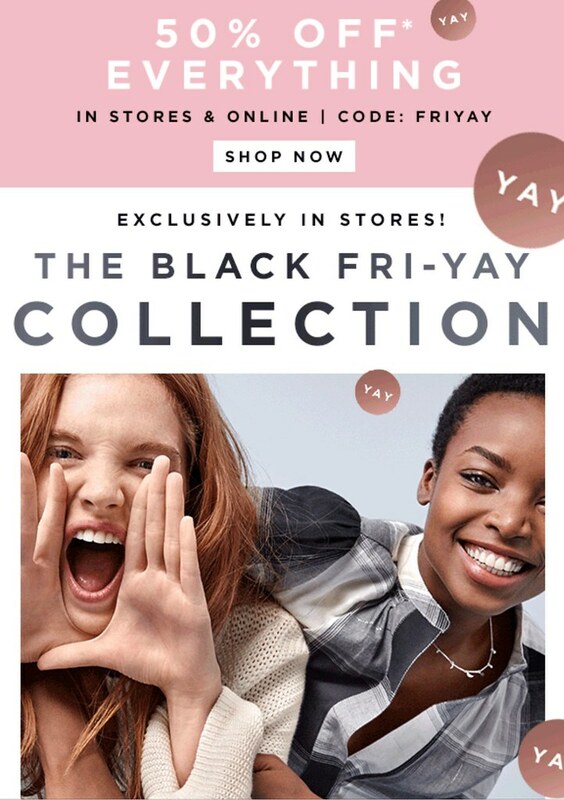 J.Crew – Take 40% off everything + FREE shipping. Use code THANKU. Valid in stores and online through November 26 11:59pm ET. Refer to my review of the Chateau Parka here. J.Crew Factory – Get 50-60% off everything and an extra 50% off clearance. Use code FRIYAY. Valid in stores and online through November 26 11:59pm ET. Refer to my review of the Vail parka here. My favorite plaid scarf is back again this season (minus the troublesome pom poms). Nordstrom – Take an extra 20% off select sale items. Valid in stores and online through November, 27 2:59AM ET. Also, as a friendly reminder, Nordstrom is really good about price matching if you contact customer service. Nordstrom Rack – Check out their Black Friday deals, take extra 30% off clearance + get FREE shipping all weekend! These Cole Haan Palaria II ballet flats are now $47.24! Talbots – Get 40% off your entire purchase. Valid in stores and online. I love and would recommend this striped flounce-sleeve jersey tee which I took in size SP (review here). Temptu – Get 25% off everything with code FALL25. I love the Temptu air which I splurged on for my little sister’s wedding last year. 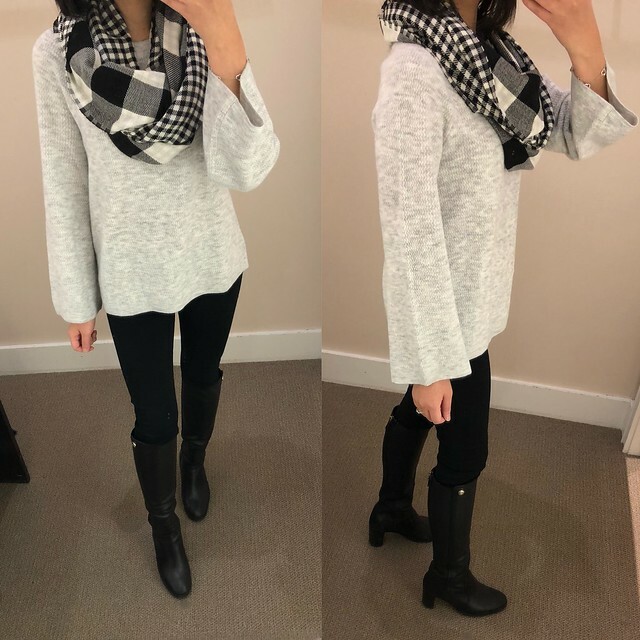 Vince Camuto – My favorite Vince Camuto Franell western booties (review here) are 40% off with code BLACKFRIDAY40! Thanks to Annie for the heads up the other day!